Seqonomics: Could 2012 be the best year ever for genomics investments? 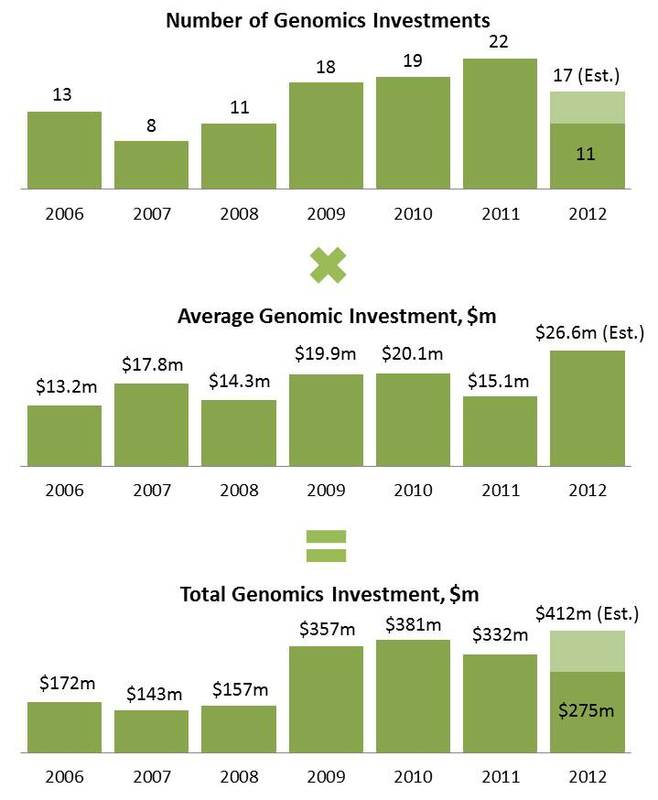 Could 2012 be the best year ever for genomics investments? Funding for biotech startups is hard to get right now. And if biotech funding is down, surely genomics funding must be down as well? After all, genomics is just a subcategory of biotech. To get a better understanding of this, I downloaded data on investment in genomics firms between 2006 and 2012 from Crunchbase and did some data crunching of my own. Click on the figure to enlarge. 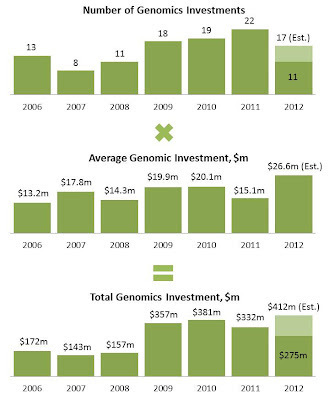 Number of investments in genomics companies, average investment value, and total genomics investments, 2006-12. Bright green in 2012 bars for numbers extrapolated to the end of the year. Whilst it is true that the number of investments in genomics companies for 2012 is probably going to be the lowest since 2008, the average amount invested is higher than in any previous year. Overall, it seems likely that there will be more than $400m in new genomics investments this year, which would be the highest on record. For genomics startups this means that it may be harder to get funding, but that once you get it, it will be generous. I used Crunchbase to compile a list of 73 genomics companies and the funding they have received since 2006. I only included companies that did receive venture capital, private equity funding, or similar. This means that my sample set does not represent all genomics companies, but I am confident that it is representative at least for US companies. Estimates for 2012 totals are based on the assumption that funding will be similar September-December to what it was January-August. Coming up next week: Funding of genomics companies in Europe versus the United States. As I already mentioned, the possibility that 2012 could be a good year for genomics investment is in contradiction with other reports, which paint a bleaker picture. A good overview and links to further sources are provided by Genomeweb in A Banner Year. this is interesting information. I assume crunchbase takes into account global information. Right? How valid is the info posted there? In the meantime I have written an update to the post above, which you can find here. As for your question, Crunchbase can be edited by anyone, so there may be some biases there. However, since I'm comparing different years from the same database, these biases are unlikely to affect 2012 more than the other years. That's why I think it's okay to compare the different years with each other.